There were two days of heavy and widespread rain on the 3rd and 4th, a spin-off from a cyclone off Madagascar. We then had several days of extremely overcast, hazy weather when the wind changed to the West and visibility was down to less than 10 kilometres, and then more than a week of heavy rain again. This latter rain was the heaviest we had experienced in two years, filling all the watercourses and dams. The downside was the damage caused to our roads and tracks and, yet again, this was compounded by the balloon operations and their support vehicles. Some of our tracks ended up looking like ploughed fields and there were deep ruts on some of our roads. · The Mara Conservancy would retain 30% of revenue for management. The concept was presented to the Board on the 12th and a draft Management Agreement circulated a few days later. Justice (Rtd) Havelock and the Chief Executive discussed this draft with Mr P Coulson on the 23rd. We are very sad to report the death of Mr Willie Roberts on the 26th in South Africa, from cancer. Willie was instrumental in setting up the Mara Conservancy and without his relationship with the local leaders, his vision and tenacity we would not be here today. Our thoughts are with his whole family and multitude of his friends and admirers. We conducted our staff transfers on the 15th. Three members of staff were released on transfer to Narok County. They were Warden Robert Maita, Sergeant Mohamed Moguche and Solomon Tierewa. One dead elephant was found right on the border, near Ol Donyo Olpaek at the end of December, there was no apparent cause of death and the tusks were recovered. Another dead elephant was found near Lugga ya Nyoka, on our side of the border on the 29th. It was a mature bull and had been dead for some time, the tusks were recovered. Our female leopard from Maji Machafu has returned after a short absence, she may have cubs again. Cheetah and lion sightings have been excellent and we had numerous herds of elephant throughout the Reserve. The total number of non-resident visitors was only very slightly above 2016 (49,249 vs 49,062), but well below 2011 and 2012 – 57,937 and 54,058 respectively. This is surprising, considering that revenue in 2017 was higher than for the preceding year. Could this be attributed to more Kenyans and residents? When we looked at the figures; the total number of visitors in 2017 was actually lower than for 2016. We had 107,254 visitors in 2017 against 113,213 in 2016. Both the number of Kenyan adults and Kenyan students dropped in 2017. A young Chinese couple overturned their car on the main road near Egyptian Goose. Over speeding in the Reserve is a perennial problem. This paper looked at the effects of human activity on hyenas and lions in the Talek area of the Masai Mara National Reserve. The authors noted that there had been a dramatic increase in hyena numbers in their study area and that the Talek West clan, with an average population of 113 individuals, is the largest clan ever documented in Africa. Whilst the Talek clans thrived despite the human activity and illegal grazing in the Reserve, the opposite was true of lions, one estimate by Dloniak was that the lion population had declined by 40%. The authors postulate that the decline in lions in part contributed to the increase in hyenas. There is no doubt that human disturbance has contributed to the decline in the lion population around Talek. There have been several known cases of lions being poisoned or speared in the Reserve and at least one case where a large number of hyena were poisoned. · Greenberg J R and Holekamp K E (2017) Human disturbance affects personality development in a wild carnivore. Animal Behaviour 132 (301 – 312). This paper compared the effects of personality development between the Talek and Mara Triangle clans. Talek animals being disturbed by human activity and the Triangle hyenas living in a comparatively natural environment. It was interesting that young animals living in a disturbed environment were more likely to explore things than those in the Triangle. However, the Triangle hyenas were bolder – a risk, as bold animals were less likely to survive in either system. The Masai Mara Martial Eagle Project produced their Annual Report for 2107. They have been monitoring 18 martial eagle nests in the Mara ecosystem, five of them in the Triangle. The project has tagged 18 eagles with GPS-GSM 27 gram transmitters with harnesses designed to eventually drop off. They have also set camera traps on a number of nests to record growth and prey species; so far they have recorded 20 prey species. The males predominantly kill game birds and small mammals, whereas the females go for ungulates (60%) and small mammals, a reflection of their greater size. John Lutenberg and Linda Porter visited for eight days to review our dogs and their training regimes. On the whole, they were happy with the puppy training and the ability of our sniffer dogs. They concurred with the Chief Executive on the lack of effectiveness of our tracker dogs and challenged the team to use more imagination in deploying these dogs. Only six people were arrested in January, the lowest number of arrests for a considerable time. It was not from a lack of trying, our patrol teams ranged over a considerable area and spent numerous nights on ambush. There were very few active poachers – their main focus continues to be hippo, especially downstream of the Mara, towards Lemai. The Ngiro-are rangers arrested one person along the escarpment on the 1st, he was hunting with two dogs. We hosted some senior personnel from WWF-USA, George Powell and Colby Loucks, together with Mr Jeff Frank, Senior Vice President in charge of Product Strategy in Flir, the company making the thermal imaging equipment that has radically changed our ability to apprehend poachers at night. They wanted a demonstration of how we used the equipment and were extremely fortunate to witness our rangers see, follow, anticipate and then arrest three, of seven, people who were on their way to hunt gazelle on the night of the 14th. These poachers were first spotted by the Ngiro-are team as they approached the Ngiro-are swamp, their movements were anticipated by the Iseiya team who drove several kilometers in the pitch dark to an area near Miungu. They were then spotted with the second Flir and arrested. This team were lucky to be present when two injured elephant were treated and they were able to test a small drone with a camera to drive one group of elephant into an area suitable for darting. The Ngiro-are rangers also managed to arrest one person during the day at Olaro Nyioke on the 14th. Another person was arrested in the same area six days later. A giraffe was found dead at Daraja la Mzee on the 25th, it had dragged a snare attached to a log for a considerable distance before dying. Four wire snares were recovered near Maji ya Bett on the 28th and our teams saw poacher activity across the river near Lemai – lots of sign of poachers hunting hippo along the river bank. They chased poachers on two occasions on the 30th and 31st but did not catch anyone. Most of the hippo along that stretch of river have disappeared. 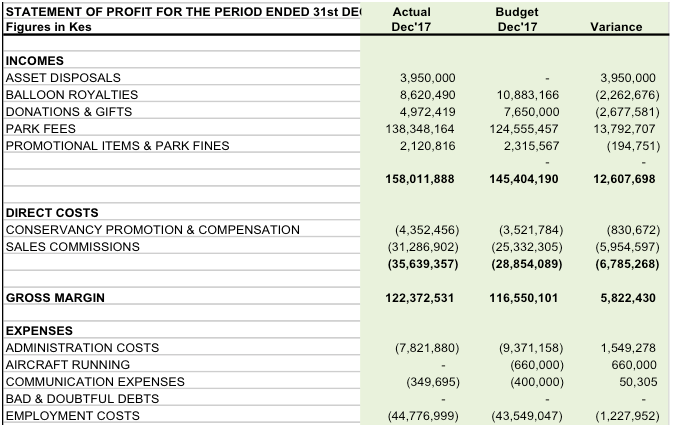 Our management accounts for the six months ending December 31st, shown in Table 1, show that we collected 9% more than we had budgeted for. The budget had been conservative, given concerns about the elections. Most of the increase came in the months of July and August – thereafter, we were close to budget. Our expenditure was up by 13%, the largest variances coming from vehicle running, repairs to infrastructure and security expenses. We spent a considerable amount on improving housing for staff, mainly to cater for the additional rangers deployed by the County. Bottom line is that we ended the six months with a smaller cash reserve than we had anticipated but believe that, with prudent management, we will be able to see ourselves through the low season March through May. The heavy rain did considerable damage, compounded by heavy vehicle traffic. We concentrated on repairing the worst areas and have started grading some of our main roads. We completed roofing the uni-huts at Little Governors and installed water tanks. We then moved on to Oloololo Gate and work is virtually complete there. We have started building a barrier and gate house on the road down the escarpment to control movement of vehicles from Mara Engai and Sun Lodge. We installed “Do Not Litter” signs at strategic points. We installed additional solar systems at Little Governors. We repaired the drift over the Sabaringo Lugga near the Kichwa airstrip.